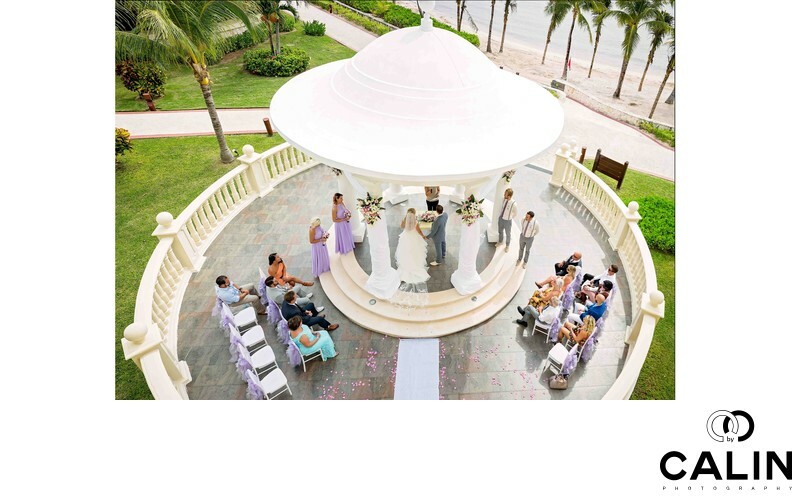 This is one of my favourite photos of this Barcelo Maya Palace Deluxe wedding ceremony. Why so? First, it involves careful preparation. Because of the high vantage point and the nature of the location, this image required a 12mm lens that I didn't have. As such, I shot multiple frames using a 35 mm lens, and I combined them in a panorama in post-production. Once the wedding ceremony started, I ran upstairs at the second level of the resort and started taking multiple shots of the same scene. Panoramas are not that common in wedding photography because of the fast-paced nature of such events. Photographing a panorama with moving subjects in its is a highly risky technique requires a lot of experience. If any of the subjects moves, the final image falls apart as Photoshop cannot stitch the pieces together. Chances are some people will have two heads, and that is not a pretty looking wedding picture. However, in this wedding shot things went perfectly. The image shows the whole wedding from a bird's eye view. On the left and right we have the guests while in the middle, under the gazebo Taylor, Katerina and their bridal party look at the officiant.